How To Dial Back Stress For High-Achieving Kids : Shots - Health News Part of a parent's job is to help kids do their best, but pushing too hard can backfire. Research shows kids in high-achieving communities are at higher risk of anxiety, depression and substance use. On New Year's Eve, back in 2012, Savannah Eason retreated into her bedroom and picked up a pair of scissors. "I was holding them up to my palm as if to cut myself," she says. "Clearly what was happening was I needed someone to do something." Her dad managed to wrestle the scissors from her hands, but that night it had become clear she needed help. "It was really scary," she recalls. "I was sobbing the whole time." Savannah was in high school at the time. She says the pressure she felt to succeed — to aim high — had left her anxious and depressed. "The thoughts that would go through my head were 'this would be so much easier if I wasn't alive, and I just didn't have to do anything anymore.' "
Does raising kids have to be stressful? Is it really dangerous for babies to sleep with Mom? Do chores have to be a fight? NPR has traveled around the world for ideas to make parenting easier. Sign up for NPR Health's newsletter to get the stories delivered to your inbox. Looking back Savannah, now 23, says the pressure started early. She told us her story as we sat at the kitchen table of her childhood home in Wilton, Conn., a wealthy community near New York. Her dad commutes to the city where he works in finance. From the outside, Savannah's life may have appeared picture-perfect: two well-educated, loving parents; a beautiful home; siblings and lots of friends. From an early age, Savannah says, she was considered one of the smart kids, and when she arrived at Wilton High School, she was surrounded by many other high achievers. Lots of kids take a heavy load of Advanced Placement and honors courses. They play varsity or club sports and are involved in lots of extracurricular activities. But by sophomore year, the high expectations began to feel like a trap. Like many kids at her school – and at elite high schools across the country – she felt compelled to push herself to get good grades and get into a top college. "Even though I was getting A's and B's, mostly A's, in all my classes — all my honors classes — I still felt it wasn't good enough," Savannah says. No matter how well she did, someone else was doing better. "The pressure I put on myself was out of control," she says. She says she felt the pressure all around her — from peers, teachers and her parents. Newfound awareness of these kinds of struggles, has started a conversation — and new initiatives — in her community. A group of parents is trying to shift the culture to balance the focus on achievement with an emphasis on well-being. Part of the equation is freeing up kids to find their own motivation and life path. There is a growing body of evidence pointing to elevated risks of anxiety, depression, and drug and alcohol use among kids raised in privileged communities. Savannah's mother, Genevieve Eason, feels she was partly to blame for the pressure Savannah felt. "I know I was talking to her by eighth grade," Genevieve recalls, "about how she needed to find out what her passions were, so she could get involved in the right activities ... so that would look good on her college applications." But after Savannah's problems began, Genevieve says, she backed off. She helped Savannah drop some of her tougher courses. And the family started to focus on well-being. "Ask your kids the question 'Am I pushing you too hard?' " says Colleen Fawcett, Wilton Youth Services coordinator. Don't just ask once, she says, ask it periodically and keep the line of communication open. "It's OK to let them out of your sight," says Lenore Skenazy, president of Let Grow, an organization that promotes childhood resilience. Let kids choose activities to do by themselves, like going to the store or walking to the park. Try this exercise from Let Grow for giving kids more control, which can buffer anxiety and foster self-confidence. Unlike supervised activities, Skenazy says, free play teaches kids how to negotiate, compromise, make friends and communicate. "When we deprive children of unstructured playtime, they don't learn how to mature or deal with frustration or fear," she says. "Try to counterbalance the highly competitive culture," says parent Vanessa Elias. Resist the temptation to overschedule your kids. Encourage them to limit their organized activities, and emphasize family time and downtime. "Up to that point, I totally bought into the idea we're supposed to push our kids to achieve. When they encounter obstacles, we push [them] to overcome those," Genevieve says. But pushing too hard can backfire. Given the pressure-cooker environment in her community, Genevieve wondered how many other teens may also be struggling. In order to find out, she got together with some other parents and counselors — and worked with Wilton High School to do something very unusual. They hired a psychologist to come in and assess the student body. On the day we visited, the seniors were preparing for graduation. In the main hallway, there was a bulletin board on which students have each pinned the logo of the college they plan to attend. We saw Dartmouth, Yale, Vanderbilt, Harvard — and many other highly selective universities. Clearly, many kids here excel. But the results of the mental health assessment showed that a lot of kids struggle, too. "The survey results definitely suggested that Wilton High School's rates of anxiety and depression with students was higher than national averages — significantly higher," says school principal Robert O'Donnell. He says he was surprised and concerned. "This is by no means unique to Wilton. 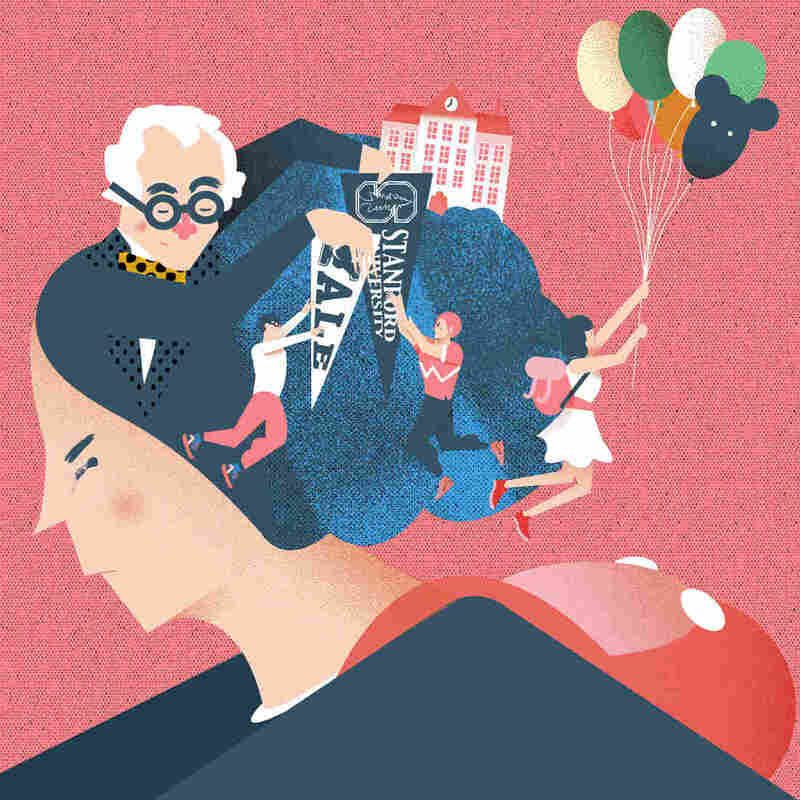 It's a common phenomenon across high-achieving schools," says Suniya Luthar, professor emerita at Columbia University's Teachers College and founder of Authentic Connections, a nonprofit that aims to build resilience in communities and schools. Luthar has been studying adolescents for more than 20 years. She has published several studies that document the elevated rates of drug and alcohol use by kids who grow up in privileged communities — where incomes and expectations are high. Surprisingly, she says, the rates rival what she has documented in low-income, urban schools. "What we've found is that kids in high-achieving, relatively affluent communities are reporting higher levels of substance use than inner-city kids and levels of anxiety and depressive symptoms are also commensurate — if not greater," Luthar says. Her most recent study, funded by the National Institutes of Health, found that rates of substance abuse remain high among upper-middle-class kids, as they enter early adulthood. The alcohol or drugs are a form of self-medication. Savannah's mother, Genevieve Eason, says she is not surprised by Luthar's findings. "People choose communities like this to give their children opportunities, but it comes at a cost," Eason says. The survey findings have been a wake-up call for the community of Wilton. "A lot of people were in denial," says Vanessa Elias. The mother of three children is the president of the Wilton Youth Council, which aims to promote the emotional well-being of the community. "People don't talk about these things," Elias says. Families often struggle silently, not realizing that their friends' or neighbors' kids are experiencing the same struggles. "So having an opportunity to create a conversation about this was really important," she says. The community has lots of ideas about how to tackle these issues. The high school is focused on continuing to train counselors, and student-directed initiatives are aimed at raising awareness about anxiety and depression. Wilton is also offering a resilience training program — GoZen! — to elementary school students. It's a research-based program that teaches coping and happiness skills. There's a body of evidence to show that resilience training can help reduce symptoms of depressive or negative thinking among children. At home, Elias says, she has tried to create a low-stress environment for her children. For instance, she limits the number of after-school activities her kids participate in so they don't spend every afternoon being driven around, overscheduled. She also limits homework time in the evening for her youngest daughter — a third-grader. As a result, "there's a lot less friction in the household," she says. And when she realized that the focus on standardized testing was making one of her daughters anxious in first grade — and giving her stomachaches — she opted her two youngest children out of standardized testing. Elias says she has been influenced by the book How To Raise An Adult by Julie Lythcott-Haims, which aims to help parents break free of what the author dubs the "over-parenting trap." But to really change things — to dial back the focus on academic achievement at all costs — will require a culture shift, says Eason. "We have to broaden our definitions of success and celebrate more kinds of success," she says. For Eason's daughter, Savannah, this means forging a new path. "I don't want to work on Wall Street; that sounds miserable to me," Savannah says. She enrolled in culinary school, and she is training to be a pastry chef. "I'm never going to live the same lifestyle I did growing up," Savannah says, "I'm not going to make that much money, but that's OK."
She has her own set of priorities. "It's not about how big your house is and what kind of car you drive. It's about happiness and peace." This is a different kind of success, one that her parents are now celebrating with her. "I spend hours making a cake, and my favorite part is when you cut it up and people eat it," Savannah says. "That's the part when you bring joy to people, and that's what's important to me now."